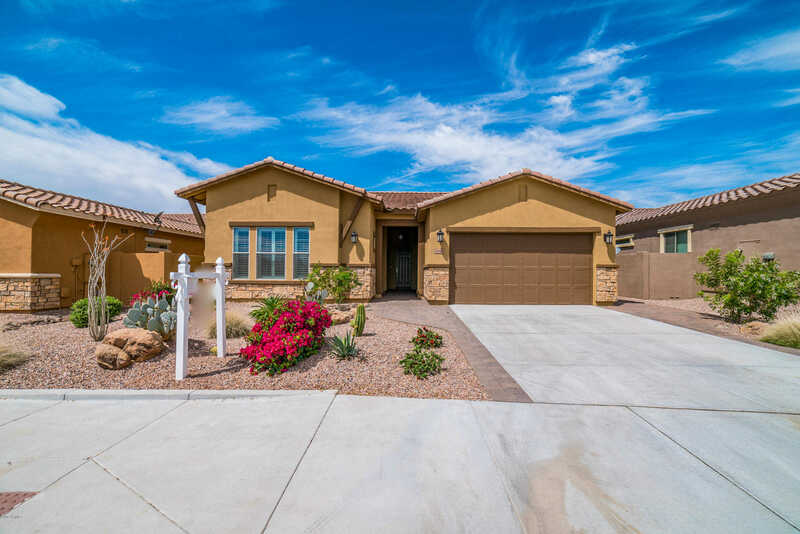 This beautiful home is situated in sought after Estrella Mountain Ranch. Amazing sunsets and golf course views from your private backyard while enjoying your heated pool and spa. Home features 3 beds, 2 baths, a study and a spacious 4 car garage. The gourmet kitchen is complete with stainless steel appliances ready for you to cook your favorite meal. Bring the outdoors in through the sliding glass door. Secluded owner’s retreat with over-sized walk-in closet and over-sized owner’s retreat shower. This gated golf course community is in the perfect spot for you to enjoy resort style living. Amenities include two residents clubs, Starpointe & The Presidio. each w/its own cafe/restaurant, fully equipped fitness centers and so much more. Directions: I-10 West; Exit Estrella Pkwy south 7 miles; Go thru the light at Elliot; Right on S. San Miguel; Left on Westar; Left on Sunward Drive; Left on W Desert Sage; Left on S. 182nd Dr. Approximate size: 7320.00 sq. ft. Please, send me more information on this property: MLS# 5908120 – $498,000 – 12028 S 182nd Avenue, Goodyear, AZ 85338. I would like to schedule a showing appointment for this property: MLS# 5908120 – $498,000 – 12028 S 182nd Avenue, Goodyear, AZ 85338.